288 pages | 30 B/W Illus. How do we make sense of the business networks we participate in and the networks we observe from a distance? Are business networks distinct from social networks, and if so what distinguishes them? How can business network analysis from a multidisciplinary perspective enhance strategic management? Emanuela Todeva deftly explores the patterns of networking and the dynamics of network relationships, to show how we can begin to tap their full potential. Of great interest to students and scholars of business network analysis, this revealing volume will also prove informative for managers wishing to obtain insights into network dynamics and its implications for strategic decision making. Business Networks expertly provides an interdisciplinary overview. It skilfully engages the reader with a range of economic, sociological, strategic management and communication theories that contribute to our knowledge of networks and networking. 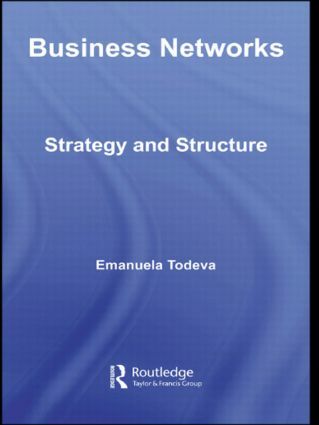 Transcending specific disciplines, and synthesizing the contributions that shape the structural, relational and cultural approaches to network analysis, Todeva’s outstanding text offers a wealth of conceptual frameworks and an exhaustive typology of existing business networks. Emanuela Todeva is currently Senior Lecturer in Strategy and International Business and Programme Leader for the MSc Technology Management programme at the University of Surrey.